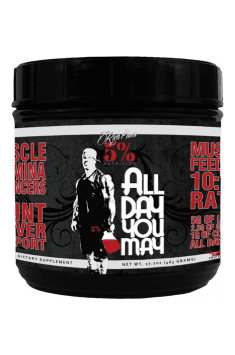 5% Nutrition AllDayYouMay is a supplement containing a complex of amino acids and vitamins designed for physically active people who want to support the regeneration of their organism and provide an anabolic environment. One box contains 465 g of easy-to-use powder available in several delicious flavours. The supplement ensures complex regeneration support thanks to the use of five formulas containing amino acids, enzymes promoting protein digestion, beta-alanine, coconut water, and more. Moreover, the product has a high content of branched-chain amino acids (BCAA) as well as vitamins C, B6, and B12. Additionally, the product also provides such substances as glucosamine and MSM, which help to reduce inflammation within the connective tissue and support joint regeneration. Vitamin C – a powerful antioxidant that helps to sweep free oxygen radicals, which are formed, e.g., during heavy workout. Free oxygen radicals cause damage in the structures of the DNA and cells in the organism. Additionally, vitamin C can reduce the level of the catabolic hormone cortisol, as well as has a positive effect on collagen synthesis and the condition of connective tissue. Vitamin B6 – participates in nutrient metabolism and is essential for the formation of many coenzymes in the body. It regulates the synthesis of essential neurotransmitters responsible for a good mood and concentration. It combats inflammation in the organism and has a positive effect on the cardiovascular system. Vitamin B12 – participates in DNA synthesis and energy processes as well as ensures proper functioning of the nervous system. It is necessary for the process of methylation, which is responsible for proper homocysteine metabolism. It helps to transport oxygen in the organism by participating in red blood cell formation. BCAA Blend – a blend of the amino acids L-leucine, L-isoleucine, and L-valine in the ratio 10:1:1. L-Leucine – the main amino acids activating the process of muscle protein synthesis (MPS) independently from the supply of other amino acids. L-Leucine activates the mammalian target of rapamycin (mTOR). Adding L-leucine to meals results in the stimulation of MPS. L-Isoleucine – a leucine isomer, it protects the muscles from catabolism and can be used as a source of energy in the process of gluconeogenesis. The amino acid also reduces the sensation of tiredness. L-Valine – participates in muscle regeneration and regulates nitric oxide levels in the body. It has a positive effect on the condition of the nervous system and can reduce nervousness and tiredness after a heavy training. Essential Amino Acid Blend – contains essential amino acids that must be delivered to the organism with food. L-Phenylalanine – an amino acid acting as a precursor of thyroid hormones and the neurotransmitter dopamine, responsible for motivation and alertness. It is crucial for the functioning of the nervous system. L-Threonine – participates in the synthesis of muscle protein and collagen. It is beneficial for the skin and connective tissue and helps to maintain a good condition of the nervous and cardiovascular systems. L-Methionine – an amino acid containing sulphur; it is a component of an important methylation substrate, S-adenosyl methionine. It participates in the synthesis of phospholipids and carnitine, increases bone mineralisation, and stimulates the production of a natural antioxidant, glutathione. L-Histidine – a precursor of carnosine, which is a compound with antioxidant properties and the ability to buffer the pH level in skeletal muscles. L-Histidine has a positive effect on the formation of neurolemmas and the functioning of the immune system. L-Glutamine – the most prevalent amino acid in the body. It regulates nitrogen levels in the organism and increases immunity. Supplementation with L-glutamine has a positive effect on post-workout regeneration and the restoration of muscle fibres. It is an intermediate in glutathione synthesis. L-Carnitine tartrate – a vitamin-like substance, it facilitates the transport of fatty acids to the mitochondria, which enables their burning. It determines proper mitochondrial function, which ensures the right energy metabolism in the body. N-Acetyl cysteine – the acetylated form of the amino acid cysteine. It has anti-inflammatory properties and reduces damage caused by free radicals. It promotes glutathione synthesis and protects the liver. The formula Amino Acid Support Blend – reduces delayed onset muscle soreness and regulates fluid and electrolyte balance. Taurine – a non-proteinogenic amino acid essential for the normal functioning of the nervous system. It helps to maintain concentration, regulates fluid and electrolyte management in the body, increases calcium levels in cells, and has a beneficial effect on insulin management. Coconut water – contains many vitamins and minerals, and its osmolality is very close to that of the human body, thanks to which it fantastically hydrates the organism. Moreover, it can reduce blood pressure and has antibacterial properties. Alpha-hydroxy-isocaproic acid (HICA) – a leucine metabolite with anabolic properties, which it owes to its ability to activate the mTOR pathway. The most significant and well-tested effect of HICA is a decrease in the breakdown of muscle protein and a reduction of delayed onset muscle soreness caused by workout-induced damage. Bromelain – an enzyme of the protease group responsible for peptide bond hydrolysis. The enzyme was isolated from pineapple and is often used in preparations containing high amounts of amino acids in order to improve their absorption. Moreover, it reduces inflammation and promotes tissue regeneration processes. Blueberries – contain anthocyanines, which give them not only the dark colour, but also a high value on the Oxygen Radical Absorption Capacity (ORAC) scale. They have many health-improving properties, such as regulating blood sugar levels, reducing blood pressure, and exerting a positive effect on the condition of the intestinal microflora. Intra-Cellular Buffer Blend – a formula facilitating the restoration of proper acid-base balance. Creatinol O-Phosphate – a derivative of creatine, which works as an internal buffer preventing excessive acidity (lower pH). During physical effort, when oxygen supply is unable to keep up with workout intensity, the process of anaerobic glycolysis begins, which results in the formation of lactic acid. Creatinol O-Phosphate helps to remove the excess of the acid, which is responsible for the feeling of tiredness and muscle burning, that way improving the quality of workout. Beta-Alanine – the amino acid and the above-mentioned L-histidine form carnosine. Carnosine reduces the concentration of hydrogen ions formed as a result of intensive training. Moreover, it reduces the production of lactic acid and eliminates tiredness. Beta-Alanine efficiently increases the organism’s exercise capacity. Joints can also be damaged during intensive workout, and the formula Joint Support Blend will ensure their proper regeneration. Glucosamine – a compound naturally found in joint cartilage and one of amino sugars, that is sugar derivatives containing and amine group. It has anti-inflammatory properties and helps to restore damaged joint tissue. Methylsulfonylmethane (MSM) – provides an element crucial for the normal functioning of the organism, sulphur. MSM participates in the process of collagen synthesis and amino acid biosynthesis. It reduces inflammation and accelerates wound healing. It takes part in the synthesis of glutathione and reduces muscle damage and soreness. To sum up, 5% Nutrition AllDayYouMay is a complex dietary supplement that increases post-workout regeneration potential. The advanced formula nor only supports muscle and joint regeneration, but it also provides amino acids essential for the functioning of the nervous system and neurotransmitter synthesis. It perfectly hydrates the body, regulates fluid and electrolyte management, and reduces the negative effects of lactic acid. Dissolve one scoop (~15.5 g) in 350-450 ml of water, take it between meals as well as before, during and after workout. Take one serving (one scoop) between meals throughout the day. The supplement is recommended for people who train heavily and/or do hard physical work for a long time. The supplement supports physiological regeneration processes in the organism and displays anabolic potential. It is a good idea to combine it with a protein product to deliver a full range of amino acids. According to the producer’s instructions, take up to 4 servings a day dissolved in about 3.7 l water and drink throughout the day. Creatinol-O / phosphate-malic acid interfusion is a combination of creatine phosphate and malic acid (creatine malate), combined into one molecule, intensifying effects of both compounds.